There’s a girl in the garden. I’m guessing this is supposed to be Simon Pegg and his portly sidekick (Joe Morton?) 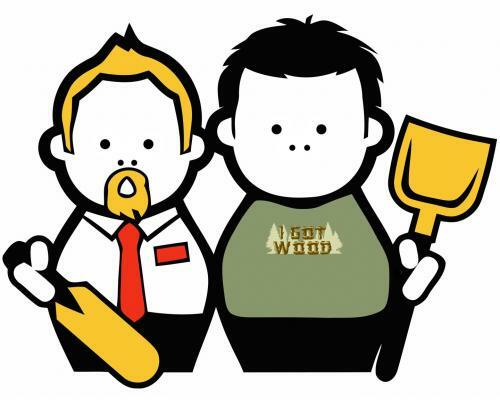 from Shaun of the Dead (since they have the weapons I think they had in that movie, even tho they both also starred in Hot Fuzz). I’d say the clothing gives away which movie, better. Yeah, I think I was going to say that too, but forgot because I wanted to make sure that I made it a point to mention I knew it wasn’t Hot Fuzz. Who the hell is Joe Morton? I thought the portly actor’s name is Nick Frost? Did I miss something? Did I just fail? Ah damn, I got it wrong. It’s Chet Morton, the portly friend of Frank and JOE Hardy. I’m getting old… A thousand apologies to all that I have confused. Joe Morton is the guy who plays “Henry” in Eureka (on the SciFi channel) so that’s probably where I got it. Cricket bat clinches it. SOTD. Shaun of the Dead rocks!